Prime Minister Sheikh Hasina on Tuesday said she never tried to retreat from doing welfare of the country and its people even after repeated death threats in her life, reports UNB. “I’ve to move with the pain of losing close relatives. The path is not easy. I know I may have to face death again ...I never tried to step back,” she said. 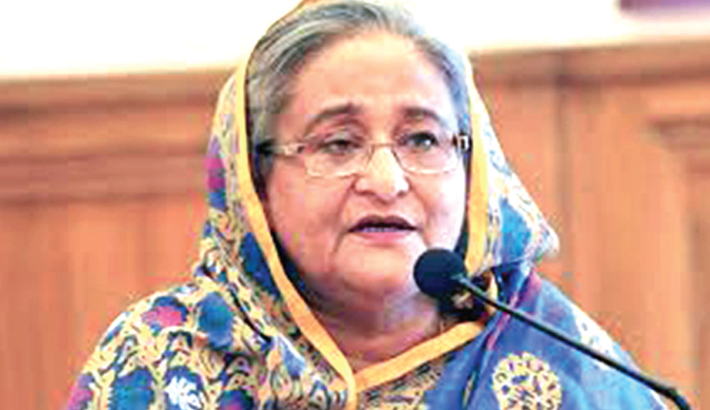 The Prime Minister was inaugurating 23 bridges on Joydebpur-Chandra-Tangail-Elenga road (N-4) under South Asia Sub-regional Economic Cooperation (SASEC) and Fatehpur railway overpass in Feni on Dhaka-Chattagram highway through videoconferencing from her official residence Ganabhaban. Sheikh Hasina, the eldest child of the Father of the Nation, said they did not kill only the country’s President, but also ruined a family completely. “Ten-year-old Russel had not also been spared. Their motive was to make sure no one of that bloodline comes (leadership) and that country’s people do not turn around again surrounding him,” she said. The Prime Minister mentioned that she herself and her younger sister Sheikh Rehana escaped the massacre as they were outside the country during the brutal killing. Talking about the bridges and the overpass which were opened today, she said these will enhance the regional connectivity of the country which will ultimately help Bangladesh open a new door for the socioeconomic development. She also mentioned that the highways the government is constructing have two types of carriageways—one for local people and the other for speedy vehicles. “We’re constructing the highways in this way to reduce road accidents and to ensure that local people continue their communication without any problem,” she said. Road Transport and Bridges Minister Obaidul Quader and Chief of Army Staff General Aziz Ahmed also spoke at the programme.